I know that in my bathroom, space is an issue. Even though I only share the space with my fiancé, we both need our designated areas for our everyday shower essentials: shampoo, conditioner, soap, and other must-haves. But making or finding space in a bathroom isn’t always easy, especially when it comes to the shower and tub area. Where can you keep your shower essentials within close reach without creating a mess? Buying a bulky shower organizer is one option – but it takes up valuable shower space. 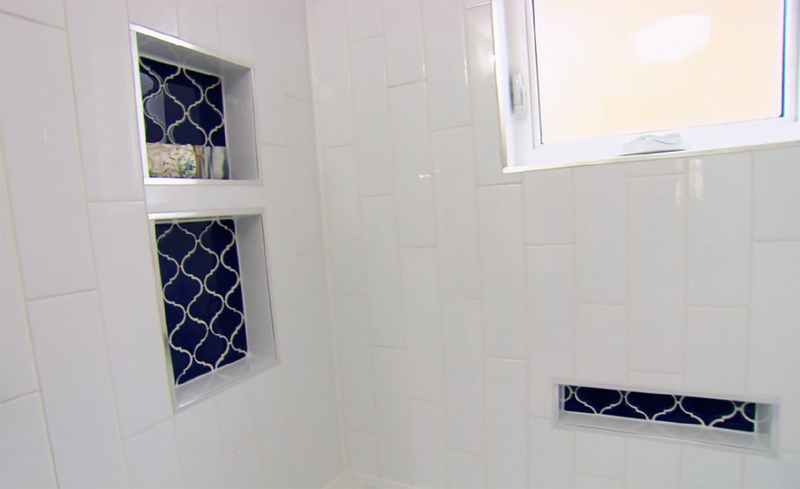 One way to reclaim your shower zone is to install a shower niche. 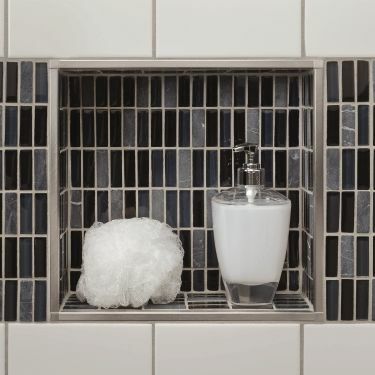 A shower niche is an open storage space, like a cubbyhole, that is installed within the wall of your shower or tub area and is used to keep all your bathroom items nicely organized. Niches aren’t just for showers – they can also be installed in bathtub surrounds. They provide a convenient and clutter-free way to store your regularly used bathing items. There are two commonly used shower niches – custom and pre-fabricated. A custom niche is built from scratch by constructing a framed box within the wall. Wallboard is then installed on all surfaces of the framed box and covered with a waterproofing membrane. A pre-fabricated niche is pre-made and does not require any materials for building a custom niche. It must be fastened to the studs and properly secured to the board, minor back framing or blocking. Why Choose a Shower Niche? If you share a bathroom with others then you will relate to my struggle of trying to maintain enough space for everyone’s bathroom essentials, without making a huge mess. Perhaps you have made use of a shower caddy or shelf to provide extra space within your shower or tub area. However, shower caddies and shelves can be a pain to clean, are bulky, and can make your shower look messy. With all the water and moisture in your bathroom, the metal ones also tend to rust over time. A shower niche is a much better solution, for relatively little expense. It’s an extremely useful feature that provides you with a proper place to keep your shower accessories, without adding bulky organizers that take up much-needed space. Everyday shower items can be kept out of the way within the wall of your shower. 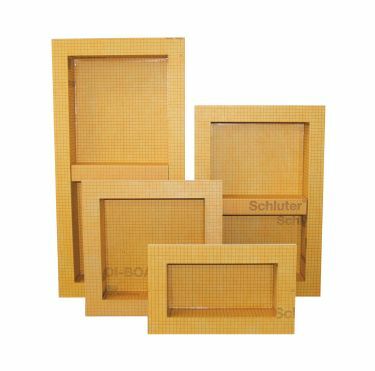 I’ve renovated my fair share of bathrooms, so when it comes time to include a niche for a bathtub surround or shower I prefer to use a pre-fabricated niche like Schluter®-KERDI-BOARD-SN, which comes in four different sizes to suit every need. It can be installed in both KERDI and KERDI-BOARD wall assemblies. Unlike traditional shower niches, these pre-fabricated niches are fully sealed, waterproof, and vapour-tight, so there won’t be any leaks. And they’re easy to install, which helps keep a steady workflow for any installer. Gaining additional space to hold your everyday shower essentials inside your shower or tub area. It keeps your shower and tub space clutter-free. You can add your own design by making the niche a focal point of your bathroom. When it comes to the back of the niche, you can add a splash of colour; install a textured, uniquely shaped or patterned tile to make the niche pop. I recently worked on a bathroom where we tiled the back of a niche with a bold blue tile that really makes the shower stand out. Shelves can be installed in the larger Schluter® pre-fabricated niches. This is great if you want to designate space for a guest or others that you share your bathroom with. A niche can be installed at any height level. Something I’d recommend for us ladies out there is to install one for your essentials at eye level and one at a lower level to be used as a footrest when shaving legs! If you need to reclaim some space in your bathroom and you’re doing a renovation, a niche will keep the clutter out. Whether you go with a pre-fabricated niche or a custom niche – well, to niche their own.